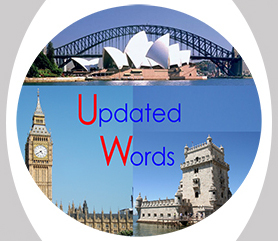 The new Financial Year has just started bringing a few exciting changes to Updated Words. We did a small restructure and decided to do a few changes in our activities online and release 2 brand new Glossaries. Over the years we've been promoting activities in our Facebook and Forum pages, bringing terms and asking readers to find their translation. We won't be changing that model but we will be doing it in a slightly different way. From this week we will start introducing the word on Tuesdays as usual, but we will start doing it in a multiple-choice exercise, where you will have to choose from 3 possible options. We will also be introducing the Grammar Months. From now on, we will have 4 months in a year dedicated to Grammar issues both in English and Portuguese. These months will be spread out through the year and each one of them will have 2 weeks dedicated to English Grammar and the other 2 dedicated to Portuguese Grammar. The activities will be similar to the other activities. A multiple-choice exercise will be released on Tuesdays to be completed with the correct answers on Thursdays. We have also updated our existing Glossaries and released 2 brand new Glossaries. These Glossaries are not complete, but they are meant to be updated as more terms become available. Every weekly term released in our online activities will be released in a Glossary and published in our website once it reaches more than 20 terms. Our new glossaries are the Aviation and Turism Glossary and the Legal Vocabulary Glossary. More glossaries will be released throughout the year and the existing ones will be updated every three months.